New book, 534 pages. The Korean War was a 20th Century conflict that has never ended. South Korea, a powerhouse economy and dynamic democracy sits uneasily alongside North Korea, the world's most secretive, belligerent, unpredictable and repressive totalitarian state. Today, tensions simmer and occasionally flare into outright violence on a peninsula dense with arms, munitions and nuclear warheads. Cameron Forbes, acclaimed author of Hellfire, tells the story of the war and Australia's involvement in it in a riveting narrative. From the letters and diaries of those diggers who fought across Korea's unforgiving hills and mountains to the grand strategies formulated in Washington, Moscow and Beijing, The Korean War reveals the conflict on all its levels - human, military and geopolitical. 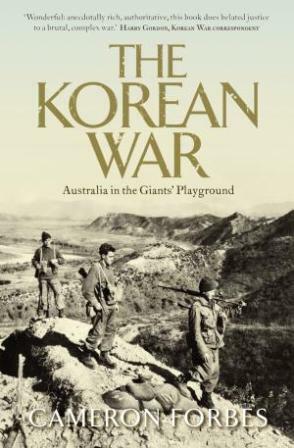 In the tradition of Les Carlyon's Gallipoli and The Great War and Paul Ham's Vietnam, Cameron Forbes has written a masterpiece that will serve as the definitive history of Australia and the Korean War. This item was added to our catalog on Saturday 05 November, 2011.